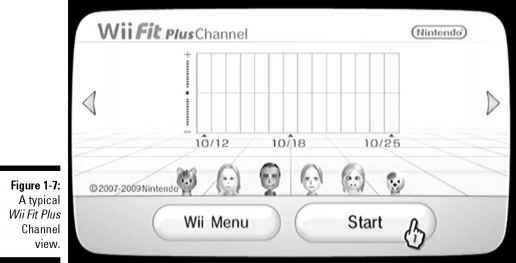 You can check your profiles and Wii Fit Plus stats, and perform the Body Test without having to insert the game disc into your system by simply installing the Wii Fit Plus Channel. Do this at the Wii Fit Plaza, where you click on the Settings wrench icon at the upper right of the screen to bring up a submenu, then click on the Install Channel option. Click OK at the confirmation screen to install the Wii Fit Plus Channel on the Wii Menu. Click OK after the Save to the Wii System Memory prompt appears. After it's installed, click OK when you see Finished Saving. The next time you access the Wii Menu, you will see the new channel, as shown in Figure 1-7. The Wii Fit Plus Channel takes up 109 blocks on your Wii's internal memory, so you need to ensure that you have sufficient space for a successful installation. Refer to the Wii Operations Manual that came with your console or Wii For Dummies by Kyle Orland (Wiley Publishing) for more on memory management.